It's finally happened. We've made contact! 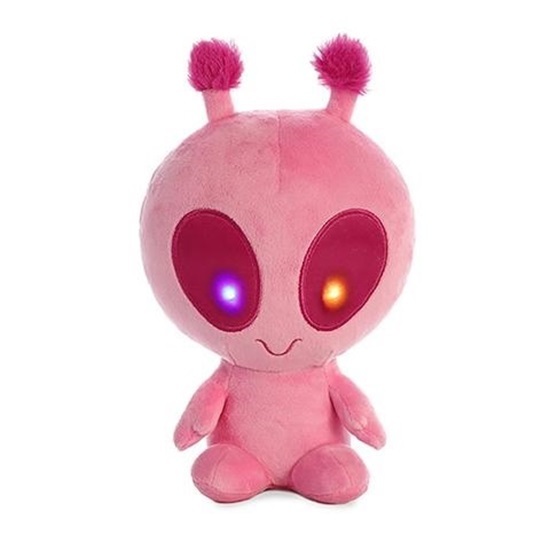 Solar the Light Up Pink Alien Stuffed Animal by Aurora has come from across the universe to enlighten mankind! Well, that seems to be Solar's plan anyway. The first thing scientists did was squeeze Solar's foot. That is typically how every scientific study begins. The foot squeeze test results were amazing. Solar's eyes lit up, flickered, and even changed colors. So maybe the mission is not to enlighten us but instead to light us up. Huh? Anyway, this pink stuffed alien is only about eight inches tall but has had a huge impact on the future of our planet. Besides having flashing, colorful eyes, Solar also loves to watch movies. E.T., Men in Black, and Avatar are a few of Solar's favorite films. Makes sense right? They're about aliens so they remind him of his friends. Solar loves the old TV show Beverly Hillbillies too. No clear reason there, he is just a big Max Baer Jr. fan. Nothing wrong with that! Solar is ready to explore the rest of the world and he needs your help. You need to take this pink alien stuffed animal everywhere with you. Show him around our planet and let him see all of the fun things we have to do. Don't forget to squeeze his foot every once in a while, in the name of science of course!